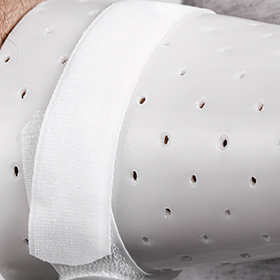 Temporary adhesion during splint fabrication and reliable permanent bonding by using dry heat. Tackiness helps orthosis stay in place during fabrication. All attachments and outriggers can be adhered easily. Aesthetically pleasing shiny white surface. Completely remouldable and can be adjusted easily over reheating locally. Avoids waste of material. 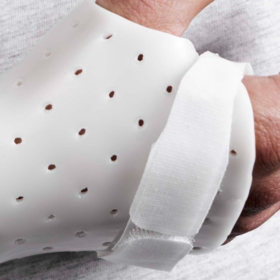 Tecnofit has unlimited potential for the fabrication of all size splints with extra care and prevention of pressure points. Thumb orthoses, hand orthoses, wrist/thumb orthoses, elbow orthoses, cervical collars, body jackets. 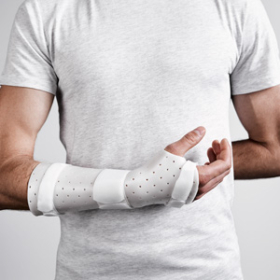 Large orthoses, long arm orthoses, AFO’s and fracture bracing. Excellent as a base for different attachments.